Prolific Flemish painter Anthony Van Dyck is considered as one of the greatest painters from the Netherlands, next to Rubens. But Van Dyck tops Rubens when it comes to portraiture. Anthony Van Dyck, one of the sons of a wealthy Belgian silk merchant, was born on March 22, 1599. He started painting at the age of ten and was already a teacher at age nineteen. Very soon he was collaborating and training with Peter Paul Rubens, one of the all-time great Flemish painters. Van Dyck was notable for being a very keen observer, his skill in lifelike renderings in his portraits and his unparalleled ability to project the majestic dignity of his subjects. He was first a court painter to the governor of the Netherlands, Archduchess Isabella. Later he became the court painter of King Charles I of England. Aside from painting, Van Dyck was a highly skilled etcher, producing over a hundred large-scale portraits of many of his contemporaries. While still in his early 20s, he studied the works of Paolo Veronese and Titian when he visited Italy. He stayed there for a while and established a successful career as a portrait painter for the Italian nobles. His popularity went beyond Italy, and King Charles I of England called him to London and appointed him as the exclusive court painter to the king, which later earned him his knighthood. 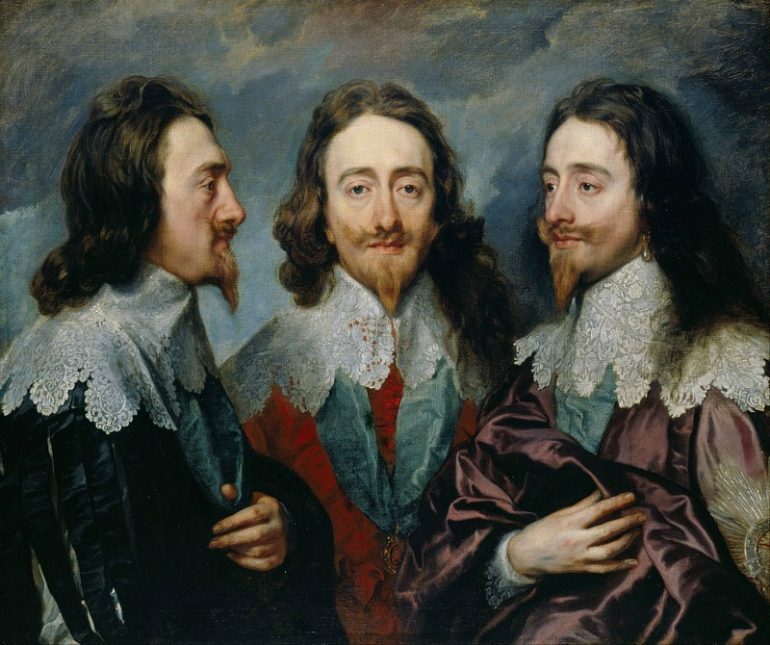 He created about 40 portraits of King Charles I, including the one above, a triple portrait of the king, which was sent to Bernini in Rome, to use as model for the bust he was commissioned to create. It was known that Van Dyck was an apprentice to Hendrik van Balen starting at age 10, which was around 1609. In just a short time he was apprenticed to Rubens, who became the leader of the art world in Antwerp about 1608. The first of Van Dyck’s works was ”Portrait of a Man” that he did in 1613, which already showed the influence of Rubens. However, Van Dyck preferred to paint directly on canvas, using a rough texture, which was not the same as Ruben’s method of using glazes resembling enamel. He used a warmer and darker colour scale compared to Rubens, and his shades and lights were sharper. Angular gestures, less harmonious proportions and exaggerated expressions were the characteristic features of his paintings. Van Dyck’s early portraits showed neutral backgrounds, which later included props such as columns to improve the setting, which was also a Rubens’ influence. His attention to details enriched the decors and costumes of his sitters, which he always rendered with convincing likenesses, their features and poses dignified and calm yet with guarded expressions. The influence of Peter Paul Rubens on Anthony Van Dyck was huge. Van Dyck was an accomplished painter by age 15 and at age 19 was already admitted to the Guild of Saint Luke in Antwerp. He soon became the chief assistant to Rubens before the age of 20. 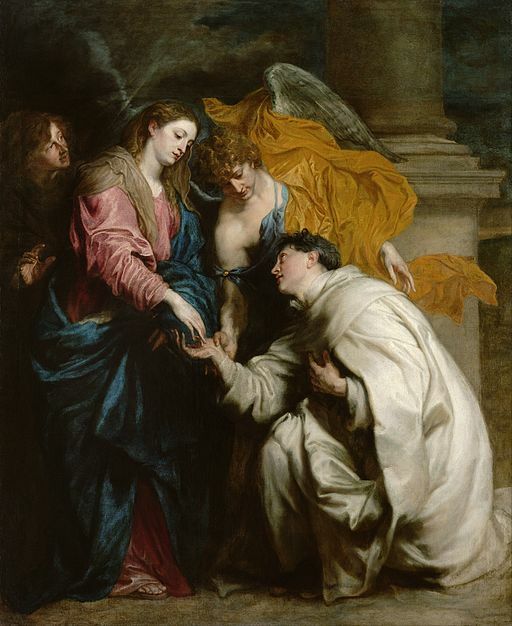 Rubens referred to him as the best among his pupils. It was not known how early Van Dyck came under Rubens’ tutelage, but the prominent painter’s style was already evident in the works of Van Dyck in 1613. Anthony Van Dyck first worked with King James I of England in 1620, wherein he was paid £100. He saw the works of Titian when he was in London that opened his eyes to new styles in composition, modeling and use of color, which enriched his own painting style. He only stayed in England for four months before moving back to Flanders. The following year, he went to Italy where he stayed for the next six years, further developing his style, such as introducing full-length portraits, mixing the artistic elements he learned from Rubens and from the works of Titian and Veronese. He returned to Flanders and stayed for five years, continuing to work as a portraitist, mostly for the well heeled and the nobility in his country. At that time, King Charles I was the ruler of England. He was an avid art collector and had even persuaded many foreign artists to stay in London. Peter Paul Rubens came and stayed for 9 months. Van Dyck on the other hand remained in contact with the English court and even worked with the agents of the king to look for paintings for the English ruler. He also sent some of his works and did commissions for the king’s sister. In 1632 he finally came to England himself, where he became court painter, with a generous pension, knighthood, a house and studio. He was also very well paid for his paintings. When the financial and political fortunes of King Charles I were dwindling, Anthony Van Dyck went to Antwerp and Paris but his projects were unsuccessful. He went back to London after a year but his health was already in poor condition. He died in 1641 and was buried in the cathedral of Saint Paul.